The other day we had what the local news called a "10 minute blizzard", as in near white out conditions. Of course, nothing stuck to the ground and it was over. The fact that 10 minutes of non-stock snow even makes the news tells you just how little snow we get around here. Still, that was our first snow of the season. When will the second snowfall come? The forecast calls for snow showers tomorrow. I guess I'd better run out and get some bread and milk :) Oh yeah, that's right, I don't drink milk. Make that soy milk. "Those that fail to learn from history, are doomed to repeat it"
With Yom Kippur over I turned on the news this evening. It was consumed with two things. The American Presidential election was down to number two after the now global economic crisis. Stock markets the world over continue to crash down. The Bush administration, once the voice of laissez-faire capitalism, is considering following the British example and taking the decidedly socialist step of purchasing parts of private banks, in effect partially nationalizing them, albeit "voluntarily". How voluntary is it if the choice is semi-nationalization or outright failure? We also have the spectacle of a possible national bankruptcy in Iceland. Has a nation ever gone bankrupt before? All these events are, I think quite accurately, being described as "the worst financial crisis since the great depression" by various talking heads on all the major and not-so-major news media. Normally optimistic economic voices are now saying we're going into a deep recession. Hello? We're already there and I honestly believe this is the start of a second great depression. 2008 and 1929 will often be linked from this point forward. I think a lot of us are going to have to rethink our lifestyles, our finances, and how to plan for our future. Too many Americans, encouraged by our consumer culture, have lived way beyond their means. A little economic panic may actually have a healthy result if people pay down debts and start saving for a rainy day. It may also make some rethink their political ideology and make a more sane choice in the November election. Those would certainly be silver linings to the proverbial dark clouds. What about me? What will I do? Believe it our not this may actually be beneficial to my business if I do some clever marketing. OK, I hate marketing. Only chasing people down for monies owed is worse. I truly loathe collections. Yet I honestly believe suddenly being very good at marketing is vital to me. Let's face it: Linux can save companies money. It can do lots of really serious work well on machines that can't even minimally run a current version of Windows. That's true both for servers and desktops. Linux can allow companies to leverage the existing, aging systems and extend the productive life of hardware they already own. There are no licensing costs either, and for small and medium sized businesses the savings involved can make a huge difference in difficult times. My expertise is Linux. I'm very good at making it turnkey, easy to use, and optimizing for performance. Now I need to be especially good at showing people how using my expertise will save them money, as in many times what they pay me for my services. It's not just Linux, of course. It's also using Free and Open Source Software (FOSS) to replace proprietary and often costly software. If I can offer alternatives that save licensing costs for multiple products a business needs the savings can add up, perhaps more than enough to make learning a new product and transferring or converting data worthwhile. Can I do it? I honestly think so. No, it won't be easy. Selling change never is. Asking people to step outside of their comfort zone and dive into new software is difficult at best. Now, though, people may make some tough choices they wouldn't have made in better times when they weren't counting their pennies so closely. A new website, perhaps a little print advertising, and a few successful engagements to create word of mouth advertising is what I need. It's a challenge but then again, riding out tough times and keeping heads above water is a challenge lots of us will be facing now. Considering all the recent gloomy financial news about the housing market, mortgage defaults and foreclosures you'd think that mortgage companies would insist on making loans that were safer and more secure. Apparently not,. For the second time in the last few weeks I received a post card offering me 100% financing and no money down on homes in my area. Considering that housing prices here are in decline and are projected to continue to decline such a mortgage is almost guaranteed to become "upside down", meaning it will be for more than the property is worth in a short time. That's part of the recipe that brought us all the foreclosures we've seen to date. It's madness. At least Senator Obama's six point plan to deal with the economic crisis calls for more regulation. This is consistent with his views in his four years in the Senate. John McCain, on the other hand, is now a born-again regulator. For years as Chairman of the Senate Commerce Committee, he was a champion of deregulation. We've seen how well that deregulation works. McCain is part of the problem and is one of the causes of the current crisis. I don't trust him to fix anything. At least with Obama there is a chance for reregulation since that change is consistent with his beliefs and his record. I originally posted the piece below in the first incarnation of this blog on February 27, 2006. With Republican Presidential and Vice-Presidential candidates who are strongly anti-choice I felt it was time to post this again. The anti-abortion position is always portrayed by the right as somehow the correct moral choice and the position that anyone who believes in G-d must take. It just isn't true and even Christianity is hardly unified on the issue of abortion. When the anti-abortion crowd states unequivocally that abortion is murder they are voicing a belief based on fundamentalist Christian interpretation of scripture. It certainly isn't based on science or medicine which would argue that you have a child at some point in the pregnancy when the fetus is viable and can live outside the mothers womb. Nobody would argue based on science that a newly fertilized egg is a distinct individual. To make that argument one must turn to religion. Similarly, based on my Jewish religious tradition and a mainstream (Conservative or modern Orthodox) interpretation of scripture I could argue unequivocally that life begins at birth, not before, and abortion is never tantamount to taking a life. Yes, I know conservative Christians use some of what they call Old Testament scripture to justify their position. The problem with this is that from a Jewish perspective Christians reorder the Tanakh (Bible), mixing up Nevi'im (Prophets) and Ketuvim (Writings). They also weigh the whole Tanakh equally while Jews give greater weight to the Torah (Law), or the five books of Moses. So, then... what does the Torah have to say about abortion? Quite a lot, actually. "My view is shaped by Jewish tradition, which, while strongly limiting instances in which it regards abortion as permissible (e,g., when the mother's physical or mental well-being are imperiled), categorically rejects the notion of abortion as murder. The classic case in Jewish law is one discussed in the Torah. Exodus 21:22-23 rules that if two men are fighting and one murders the pregnant wife of the other, the killer is executed. But if instead of killing the wife, he wounds her and causes her pregnancy to be aborted, "the assailant shall be fined." As this passage makes clear, whatever value the fetus has, the Hebrew Bible (which Christians call the Old Testament) doesn't grant the status of human life. If it did the punishment for killing the fetus wouldn't be a monetary fine, but the same as that for killing the woman, i.e., death. Therefore, according to the Hebrew Bible, abortion is definitely not murder." It should not be surprising that Israel, a Jewish nation in which Orthodox religious leaders have considerable sway, permits abortion on demand. Israel, unlike the United States, does not have separation of religion and state. Abortion is a necessary evil. The choice must belong to the woman. One would hope she would consult with her doctor, her spiritual advisor (in a Jewish setting this would be a rabbi), and, if appropriate, the father. The state, though, has no right to interfere. In a nation where one of it's chief founders, Thomas Jefferson, called for "a wall of separation between church and state" imposing a ban on abortion based on one religious belief, no matter how prevalent, is simply wrong. If polls are right a majority of Americans are pro-choice in any case, not that numbers should matter. I, as a member of a religious minority, do not want to see any one religion or set of beliefs given supremacy over all others. That issue goes far beyond abortion. Once that happens, once the United States starts moving towards theocracy, it would no longer be a country I could be comfortable living in. Banning abortion based on Christian religious belief is, indeed, theocratic. I certainly don't want the state or someone else's religion making medical decisions which could have severe consequences for the woman involved for the rest of her life. Tonight, on the seventh anniversary of the terrorist attacks on 9-11-2001, MSNBC ran the NBC coverage of the events in real time beginning at 11 PM Eastern Time (US). It may still be running for all I know. I couldn't watch any more. On the morning of 9-11-2001 I was in a Red Hat classroom at their old location in Durham taking a prep class for certification. Instead of learning the inner workings of Red Hat Linux we all ended up watching the events unfolding on TV. I remember watching the second plane crash into the tower, the buildings collapsing, and so on. Watching it again seven years later I ran through the whole gamut of emotions again: the horror, the sense of loss, and the overwhelming anger at those who did this. In the past week we read and heard reports of a U.S. strike at a Taliban stronghold inside the South Waziristan region of Pakistan. The attack has drawn sharp criticism from the Pakistani government which has vowed to defend Pakistani sovereignty. Our so-called allies in France and Germany have also criticized the U.S. military action. The Pakistanis, in promising to defend the sovereignty and territorial integrity of their country are, in effect, threatening to turn their arms on U.S. and NATO forces fighting the Taliban and al-Qaeda. I seem to remember Senator Barack Obama warning during one of the Democratic primary debates that Pakistan would become a major problem for the U.S. He took some flack for his comments if I remember correctly. He seems prescient about now. My feelings on this are clear. If the Pakistanis choose to harbor and even defend Taliban and al-Qaeda forces they are, in effect, changing sides in the war. They may find themselves at war with the United States. I, despite my normally left-leaning politics, am with the conservatives on this issue. That is one war I would wholeheartedly support. I also would not care one little bit if the French and Germans were upset about it. Tonight's coverage of 9-11 was a stark reminder of why we are at war in that part of the world. More Americans were killed on that day than in the Japanese attack on Pearl Harbor. My main criticism of the Bush administration actions is that they have not fully and forcefully prosecuted that war and brought it to a successful conclusion. O'Reilly Media has been reorganizing and restructuring their website recently. One of the net results is that my articles and blog posts on Linux, Open Source Software, and computing in general have been moved around a bit. I originally was writing for the old O'Reilly Linux Dev Center blog. Then it was O'Reilly News from June through September. Now it's O'Reilly Broadcast. You can also find all of my writing for O'Reilly, old and new, albeit listed in no particular order I can fathom, here. In addition, all my new writing for O'Reilly is available via atom feed. Confused yet? Hopefully this is the last set of changes. The simple version: new stuff here or by atom feed. Tropical Storm Fay is expected to make a third landfall in or near Flagler Beach, Florida this afternoon. The storm brought up to 30 inches of rain to the Melbourne area and heavy flooding. The storm is moving slowly so Florida will continue to experience more rain and more flooding, mainly in areas further to the north. Further south, in Palm Beach County, there is little or no flooding. This isn't a hurricane and for most people in that county there is little or no damage from the storm. My mother was not so lucky. Her roof was damaged on Tuesday. She has moisture in the garage and some plaster has fallen. A roofer came out yesterday, looked at the damage, left some materials, and promised to come back today once the rain had passed to do repairs. I guess this is just another reminder that living in Florida means dealing with hurricanes and tropical storms. This is also a reminder that if the view held by most responsible experts in the field is that global warming will cause stronger, larger and more frequent storms. Anytime some right winger talks about "global warming alarmists" or complains about the cost of making changes in our energy policy to reduce greenhouse gas emissions we need to remind them of the very real financial and human costs of doing nothing. I never thought I'd say this but I am very glad that John Edwards did not win the Democratic nomination for President. Enough said. Carlos Guirao was an original member of Neuronium, appearing on their first five albums. The New Digital Dream is probably still my favorite Neuronium disc even though there have been plenty of excellent albums in the years since it was first released. Guirao also played on A Separate Affair, the collaboration between Neuronium and Vangelis which is one of my favorite pieces of ambient electronic music to relax to. After he left Neuronium in 1982 Guirao recorded one solo album and then was part of a techno duo called Programa. Aside from the mid '90s releases of In London (the Neuronium & Vangelis CD single) and A Separate Affair, both of which were recorded in 1981, there has been nothing new from Guirao in something like 23 years... until now. A friend visited Guirao and borrowed a tape of his unreleased second solo album. After listening to it he obtained permission to distribute the album, Pesadillas De Un Ser Viviente, Spanish for "Nightmares of a Living Being", at no charge via the Internet. As a result Carlos Guirao's album has been released on the 'net and can be found here. Oh, and yes, it's perfectly legal to download. The music covers a variety of styles. It's mainly upbeat electronic music with some drumming and occasional vocals. It's closer to Programa than to Neuronium but really doesn't sound like either one. There are bits that remind me of Jean-Michel Jarre or Christopher Franke but there is probably more that's pretty unique. The 16½ opening track, "Oceanic", is probably the highlight of the album while the fifth track, "Desconocido", is probably the most interesting, at times giving just a bit of the Neuronium sound, perhaps with elements of '80s or '90s Tangerine Dream mixed in. This isn't Guirao's best work to date and there's a bit more of the commercial synth-pop feel than what I usually like, but it's skillfully done and some of the tracks are quite good. Definitely worth a listen. Late last week I downloaded and installed Slackware 12.1 on my aging (OK, old) Toshiba laptop side by side with Vector Linux Light. I'll post a full review to my O'Reilly Linux Dev Center blog once I've had more opportunity to use the latest version of Slack. My first impression: Slackware is still Slackware. The installer assumes you know what you are doing (think Expert install if you're an Ubuntu user) and that you want the ability to control every aspect of the installation. A newcomer to Linux would be utterly, totally lost. I've actually done two installations: a fully functional one with an Xfce desktop and all the dev tools that currently occupies about 2.7GB of disk space, and a truly minimal but usable installation with a minimalist window manager (PekWM) and a handful of apps and tools. That takes up only 600MB of disk space. Slackware always was flexible and that hasn't changed. You can tell you're dealing with a distro for serious Linux geeks when booting into the GUI isn't even offered as an option by the installer. Heck, the installer doesn't even deal with X configuration. You start at the command line. GUI system administration tools? You can get them from third parties but Slackware itself is devoid of such things. Edit your config files or use command line tools. Is this a bad thing? If you know what you're doing and don't mind taking some time to get your configuration right and your favorite apps from various third party sources it really isn't. OK, it's time consuming but the end result is a fast, rock solid system. That's what Slackware is known for. It remains seriously user unfriendly, hence all the derivative distributions like Zenwalk, Vector Linux, Wolvix, etc... that try and fix that. They all succeed to a large degree, giving users a friendly environment with all of the speed and stability. Most of the usual third party packages sources like LinuxPackages.net and Slacky.eu don't have a full selection of apps built for 12.1 yet but that is rapidly changing. The project I'm working on is going to force me to do a lot of compiling from source in any case. Could I live with Slackware as my main distro? Yes, easily. Would I recommend it? Only to those who know what they are getting into. In a way I've come full circle. In late 1995 I was introduced to Linux by a coworker. When I asked which distribution to choose she suggested two: Red Hat Linux and Slackware. I chose Red Hat because she said it was easier to learn. It's also what she ran on her workstation in the office. Slackware was the second distro I looked at all those years ago. What's changed since then? First off, I was very skeptical about Linux at the time and probably for about three or four years after that. I didn't think it would ever be a serious OS or that it was anywhere near ready for prime time. That sounds silly now but 13 years ago the state of Linux was still pretty primitive. Second, I don't think any of us would have dreamed of downloading a 3.8GB DVD iso image in an hour and a half and burning it ourselves. Thankfully time and technology really do march on. What hasn't changed? In a fundamental way Slackware is the same as it ever was. It isn't any easier to get going now than it was all those years ago. You really do have to either know how Linux works under the hood or else you have to be willing to learn. Last weekend I lost my desktop system to hardware failure -- the kind of failure not worth repairing. This closely followed a laptop dying as well. I found myself scrambling to make life and work go on with less for now. The end result will probably be that I'll buy two systems in the coming weeks, a small and inexpensive travel system, probably an Asus Eee PC I wanted anyway, and something powerful enough to be a desktop replacement and to allow me to do demos for consulting customers or potential customers. For right now I'm down to two systems, both laptops, both very long in the tooth. I'm writing this on my five and a half year old vintage veteran Toshiba Satellite 1805-S204, with a 1GHz Celeron processor, 512MB of RAM, and a 20GB hard drive. The second system is 10 years old: my one surviving itty bitty Toshiba Libretto SS1010, a system about the size of a paperback book with a 233MHz Pentium MMX processor, just 64MB of RAM, and a minuscule 2.1GB hard drive. I decided to rebuild both with an idea of optimizing for speed. The idea is to use a Linux distribution designed to get the most out of limited hardware. Don't misunderstand me: Vector Linux 5.9 Standard, Xubuntu Hardy Heron 8.04, and Wolvix Hunter 1.1.0 all ran brilliantly on the Satellite. Still, if I'm going to do serious work I want to use as few resources as possible for the desktop and overheard and leave as much as possible for applications, particularly things like OpenOffice and multimedia apps that eat memory. I decided to play with fire and try out some beta code, particularly Vector Linux Light 5.9 Beta 5. This is the first beta with the new LXDE (Lightweight X11 Desktop Environment). The previously offered window managers, JWM (still the default) and Fluxbox, are also still included in the iso. There are some bugs which I've dutifully reported as you'd expect in a beta but nothing serious. All in all it works very well and is remarkably close to ready for prime time. Best of all... it's fast on the Satellite. Really fast! LXDE looks good. Vector Linux has a unique replacement for the HAL daemon called VL-Hot. It doesn't continually poll the hardware bit rather is triggered by udev events. You can choose between VL-Hot and HAL in Vector Linux standard as either will work perfectly well with KDE and Xfce. VL-Hot also works correctly with pcmanfm which is used to control desktop icons in LXDE and in the Vector Linux Light implementation of JWM. Not only is this far less resource intensive than HAL but the fact that it mostly works well on lightweight desktops is truly impressive. This is a huge step forward for those with limited, low end hardware and for green computing in general. I'll definitely be writing more about LXDE, VL-Hot, and Vector Linux Light in more formal articles and reviews for my blog over on the O'Reilly Linux Dev Center. I just thought a quick, informal posting of my first impressions might be of interest to the more adventurous Linux users out there who like to play around with bleeding edge software. The nice thing is that this is working well enough that it doesn't feel like bleeding edge. I've actually had more problems with the released version of Xubuntu Hardy Heron, but that's another story. I also have the ancient Libretto running Damn Small Linux for the moment. An installation of Vector Linux Light seemed to go flawlessly but when I rebooted I got a kernel panic. I've seen this before with VL 5.9 and I've reported it as well. I'll be experimenting with a few very small lightweight distros on the box in a dual boot configuration with DSL. What I want is a fairly current 2.6.x kernel and current if lightweight apps, something DSL just doesn't offer. I'll definitely write about what works for me. Far more disappointing to me than the results was what a nice old lady who was working at the polls told me. They had a very slow day with very poor turnout. For once North Carolina actually had a say in determining who would be the Democratic nominee for President. We had major statewide races in both parties. In this county we also had a school bond issue on the ballot. You'd think people would come out and vote but at least here they really didn't. I find this sort of voter apathy very troubling, particularly with all the challenges our area and our country as a whole now face. Don't people realize how much the outcome of the 2008 elections will effect our future? I guess not and that is truly sad. You get the idea in listening to Synapsia that Michel Huygen sat down with a stack of old vinyl LPs before recording this album. For example the third track, "Vortopsia", sounds like a recent Neuronium track for all of a minute. Then the electronic bass line kicks in and the synth melody changes and you get the feeling of some vintage Tangerine Dream in their mellower moments. The piece could have been inspired by the B-side of Stratosfear or "Haunted Heights" from '70-'80. Every track on Synapsia has an electronic bass line. Some of it definitely has that vintage sequencer driven Berlin School sound. There's a fair amount of Vangelis and Patrick O'Hearn influence as well, with a dash of Klaus Schulze here and there. Really, though, I think more than anything Huygen listened to his own early works with Neuronium. Don't misunderstand me; there's none of the high flying space rock of The New Digital Dream. Huygen is completely on his own now despite keeping the Neuronium name. At times I wish it wasn't so. "Brainsucker" could have really benefited from the powerful electric guitar that Santi Pico brought to The Visitor rather than a synthesized sort-of guitar sounding section. All in all what Huygen has done is blend the gentler sound of newer Neuronium with the sensibilities and sounds and influences of early Neuronium. The result doesn't sound like something out of the late '70s and early '80s. The instrumentation is pure 21st century. The good news is that it doesn't sound like sickly sweet new age glop either. It's brilliant, interesting electronic music that builds in complexity as it goes. It's an updating of the early Neuronium feeling in a way that's long overdue. 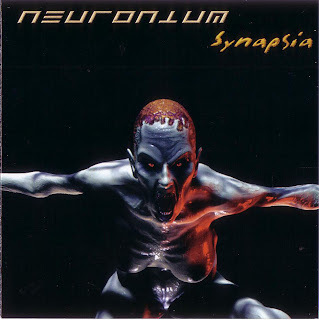 Synapsia is the best album released under the Neuronium name in a quite some time. NOTE: I also posted this review to Discogs. "God delivered me from the evil that is Dr Who, materialism and alcoholism." So says Simon White, who, by now, has sold off an extensive collection of Dr. Who stuff on eBay. Christianity saved him from the evil of Dr. Who. Uh huh... Now who will save him from the evil of fanatical Christianity? Oh, and no, I'm not anti-Christian, really. I am anti-fanatic though. I'm also looking forward to the fourth season of the new Doctor Who, the 30th season overall. When I checked my inbox this morning I was surprised to see an e-mail from Hans-Joachim Roedelius. Herr Roedelius is one of my favorite musicians. I met him in person at a performance he gave in Asheville, NC in 1999 and I have corresponded with him a couple of times, most recently after I expanded the WikiPedia page for Cluster. Herr Roedelius was kind enough to provide a photo and to fact check the page for me. It turns out the e-mail contained a link to Avaaz.org urging people to sign an online petition to be delivered to Chinese President Hu Jintao on March 31. The petition urges restraint, respect for human rights, and the opening of a dialogue with the Dali Lama. While I have little hope that the Chinese government is at all open to or moved by international public opinion I certainly see no harm in signing the petition. Avaaz.org wants at least 2,000,000 signatures and they are more than 80% of the way there. Who knows? Maybe, against all odds it will even do a little good. I encourage everyone to take a couple of minutes to sign the petition. I also thank Herr Roedelius for championing this issue and giving me the opportunity to do what I can. Today both John Edwards and Rudolph Giuliani dropped out of the race for the White House. Senator Edwards was the only candidate I really felt good about -- one I would vote for because I believe he'd make an excellent President, just not that he'd be less of a disaster than the opposing candidate. Mayor Giuliani was the only Republican in the race that wasn't totally unpalatable to me. He's the only one I'd even consider given my pro-choice position, my belief in equal rights for all Americans, even gay and lesbian Americans, and my support for restrictions on handgun ownership. There are a lot of Giuliani's positions that I'm uncomfortable with but from the Republican field he was the best available. Of the choices remaining I have no doubt that Senator Hillary Clinton would make the best President. She is a two term U.S. Senator with what I consider an excellent voting record on the issues important to me. If I go by issues and not personality or campaign style there is no question that she has the qualifications and experience to be President. I don't believe the same can be said for Senator Obama. One key issue to me is support for the State of Israel. I believe anyone who doesn't understand Israel's importance to the United States as a strategic ally in the Middle East doesn't have much of a clue about foreign policy. Since entering the Senate Hillary Clinton has been a steadfast supporter of Israel. She admitted early in her first term that it wasn't always so and many on the right will never forgive her for a certain meeting and photo op with Suha Arafat when she was First Lady. Senator Clinton claimed after entering the Senate that studying the issues in the Middle East forced her to alter her position. Whether that change was heartfelt or a political necessity for a Senator from New York I simply can't say. I can say that her voting record, her speeches since then, and her actions show that she understands the importance of Israel now. Once again, I am not sure I can say the same of Barack Obama. There isn't much of a record there. Perhaps in four or eight years I'll be convinced that Senator Obama is ready for the Presidency. Perhaps then I will look at his record and extol his virtues. I can't do that yet and in a dangerous world we need an experienced leader. Senator Hillary Clinton is the best remaining candidate with the credentials to be that leader. While the pollsters and pundits were pronouncing John Edwards' campaign for President dead after his third place finish in New Hampshire, Democrats in Nevada were showing their own independent streak. The latest polls from Nevada show Senator Edwards in a statistical dead heat with Senators Clinton and Obama. The Nevada caucuses are followed by the South Carolina primary. Senator Edwards was born in South Carolina and won the state primary in 2004. It's certainly possible that a win in Nevada would revitalize his campaign sufficiently to make him very competitive there. I'm urging everyone to ignore the pollsters and pundits, the same people who predicted a big Obama win in New Hampshire that never happened. These are the same people who also left John McCain for dead months ago in the Republican race. He doesn't seem dead now, does he? 47 states have yet to vote in the race for the Democratic nomination. The people of those states will decide who the nominee will be, not a bunch of TV talking heads. Electability: While I personally think Senator Clinton has done a fine job representing New York in the U.S. Senate I seriously question whether she can win a national election, pollsters and pundits to the contrary not withstanding. Hillary Clinton is a divisive and polarizing figure. Most everyone has already made up their mind about her and she has huge negatives. I find it very difficult to believe she will attract the independent and moderate Republican voters she would need to win in November. Senator Obama has things in his past that the Republicans will use to swiftboat him. By contrast Senator Edwards has a record of being able to successfully defend against attacks from the Republicans and to attract unlikely voters. I lived in North Carolina, a truly conservative red state, when he defeated incumbent Senator Lauch Faircloth, a protege of then senior North Carolina Seantor Jesse Helms. Edwards came from 30 points down in the polls to win that race. The Economy: As a recession looks more and more likely, as oil companies and other huge corporations continue to make record profits, as the housing crisis fueled by predatory lending practices deepens, and as middle class Americans increasingly worry about their economic future, I think more and more people will realize that Senator Edwards economic message makes good sense. We need a leader who is not co-opted by large corporate interests. Health Care: Senator Edwards is correct when he says that mandatory coverage is a necessary ingredient of a successful national health care program. Insurance companies make their profits by spreading their risk among a large pool of insured. There is no larger pool than everyone. A mandatory program spreads out the risk as far as is possible and will be less costly than a program that simply doesn't insure everyone. Making health care available isn't enough. Foreign Affairs: Senator Edwards has shown himself to be both knowledgeable and sufficiently experienced to understand and deal with the challenges we are facing in the world, particularly in the Middle East. Senator Edwards also has a long record of supporting Israel, our most important ally in the region. While Senator Clinton also has a good record vis a vis Israel since entering the U.S. Senate I feel that Senator Edwards' support has been unwavering and heartfelt. Learning From and Admitting Mistakes: Senator Edwards voted to authorize the war in Iraq. He has been willing to admit that was a major mistake in hindsight. Senator Edwards ego isn't so huge that he can't admit a mistake and learn from it. I could go on but those are areas where Senator Edwards is clearly different than the other two serious contenders for the Democratic nomination. I urge everyone to study Senator Edwards' record and join me in supporting his candidacy.